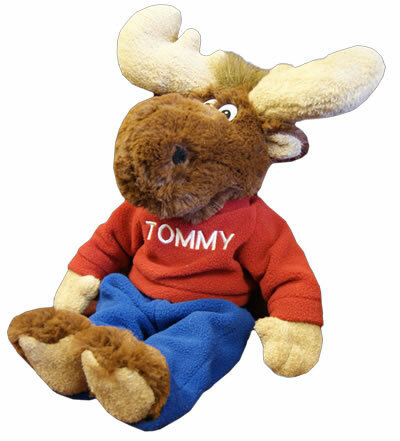 Tommy Moose® is a friendly, playful, cuddly moose doll whose sole purpose is to bring comfort to children in times of stress, uncertainty, or anxiety. He personifies one of the cornerstone tenants of the Loyal Order of Moose: caring for children. Tommy originated as a Moose community service project in Connecticut and soon spread throughout the US and Canada. Since 2002, over 100,000 Tommy Moose plush dolls have been donated to shelters, hospitals, and emergency workers, who in turn deliver them to children in need of some comfort when facing some of life’s biggest challenges. 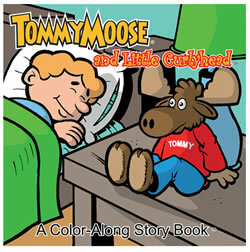 The Tommy Moose character has grown and developed beyond the comforting plush toy program. Tommy’s heart-warming “origin” appears in a unique children’s Color-Along Story Book® a format that combines an easy to read story in pages suitable for youngsters to color. Tommy also appears on complimentary bookmarks, available at many public and school libraries courtesy of Moose Lodges and Chapters in the U.S. and Canada. The bookmark also includes a list of safety tips for children to follow while using the Internet. A line of infant through toddler clothing has been developed bearing Tommy’s image, and the Tommy Moose life size mascot appears throughout the country in parades and events, meeting and greeting children and posing for pictures. Tommy Moose is a Registered Trademark of Moose International © & ® 2015, all rights reserved.